Remember when you actually had to wait for a delivery? It seems like a lifetime ago when you had to wait a week or more for your packages to be delivered. Now, companies like Amazon have led the charge of getting things delivered in only one or two days. This may seem like a change that happened overnight. However, on demand delivery services have had a long and strange history. Keep reading to discover the evolution of on demand! What Are On Demand Delivery Services? We have put together a comprehensive guide to the evolution of on demand delivery. Before we go any further, though, it’s important to establish exactly what on demand delivery services actually are. The most basic definition of on demand delivery is that it is the very speedy delivery of a product after you have placed your order. Behind the scenes, on demand delivery service is actually much more complex. It involved companies such as Amazon figuring out how to solve some of the complex logistical issues involved behind making deliveries speedier. In order to do this, they had to tackle one of the biggest logistics issues of all: last mile delivery. The biggest obstacle to speedy on demand delivery is what is called “last mile delivery.” And it was an issue that vexed some of the biggest companies in the world for decades. Basically, shipping items across the country or even across the world is the easy part. Chances are that you have marveled at how fast an order from, say, the west coast made its way over to the east coast. However, the slowdown occurs once the item is in your town. Companies must balance delivering everything to each customer’s door while also not messing up the timing of their various deliveries. In time, things like peer to peer delivery would help to close this gap. Before that, though, Amazon would work on perfecting deliveries in conjunction with existing delivery services. As you know, Amazon was the really big game-changer in terms of on demand delivery. And it all started with a simple concept: Amazon Prime. Amazon began offering free two-day shipping back in 2005. However, there was a catch: this “free” shipping required an annual membership with Amazon Prime. This proved to be a great short- and long-term strategy for Amazon. In the short-term, these memberships helped to subsidize the necessary costs involved with moving thousands of new orders a day and ensuring they were delivered within two days. As a long-term goal, however, Amazon was making Prime an indispensable part of how customers shopped. Over time, they would begin to add additional services for Prime members, including the ability to stream free music and movies. This culminated in the creation of Amazon’s Prime Day. As the name implies, this is a day of celebrating Amazon Prime with special sales intended only for Prime members. The focus of this guide is the evolution of on-demand delivery services. However, it’s important to note that this was part of a larger cultural shift in consumer attitudes. In short, the world soon became on-demand everything. Faster internet connections had led to streaming video through services such as Netflix. This led to the death of various movie rental chains such as Movie Gallery and Blockbuster video. Meanwhile, Apple had kicked off a new kind of musical revolution where customers could pay to download a single song or an entire album to their iPods. Other consumers could now skirt the law and download music illegally and load it onto their iPods to play. This was a time period in which consumers became very accustomed to getting what they wanted as soon as they wanted it. Therefore, Amazon and others embraced on demand delivery so they could keep up with the fast pace of consumer demand. A few years later, another cultural shift took place. And this shift ended up changing the world of on demand delivery once more. The so-called “gig economy” eventually gave way to various peer to peer services. This refers to any service where you are dealing directly with an individual rather than a larger business. This led to everything from peer to peer lending to the advent of Etsy and Uber. And before too long, there was peer to peer shipping. Uber eventually created Uber Eats as a way to transport non-delivery food to people at home. And companies like Postmates helped deliver groceries to people who could not or would not leave the house. While Amazon did not create the peer to peer model, they certainly took note of it. And they eventually created their own version of peer to peer in the form of Amazon Flex. Amazon Flex took the same idea behind Postmates and Uber and applied it to Amazon packages. Specifically, this is an on demand delivery service in which anyone can deliver packages from Amazon. The Flex employee receives packages from Amazon at a time they have scheduled via a specialized app. And then they can deliver these packages to recipients in nearby neighborhoods. This on demand delivery service is not intended to provide a full-time source of income. Rather, like most of the “gig economy,” it lets people earn a few extra bucks here and there as needed. Many have wondered if Amazon will fully put brick-and-mortar stores out of business. However, giant companies like Wal-Mart are not going down without a fight. Now, Wal-Mart offers shipping directly to customers’ houses. And along with their new pick-up service (in which you order ahead of time and have the goods delivered to your car), this helps make brick-and-mortar shopping a little more convenient. Now you know the evolution of on demand delivery services. But do you know who can deliver everything with speed and accuracy? At ASAP Courier, we offer all the delivery and courier services you need. To see what we can do for you, come get a free quote today! 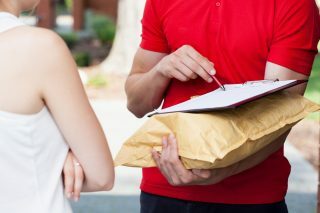 previousWhat Are the Qualities That Make a Great Courier Service?